According to Moonalice legend, the tribe has long struggled with the question of which came first: the concert or the poster? Tonight’s poster by David Singer is an instant classic, but it does nothing to resolve the matter. The music vs. poster debate raged for centuries, each time more sarcastic than ever. Verbal combat eventually paralyzed the tribe, so the matriarchs organized a quadrennial festival of intellectual games, known as the M-lympics. If you have been riveted by NBC's broadcasts from London, you may not know that the M-Lympics have been going on inside people’s heads for the past two weeks. 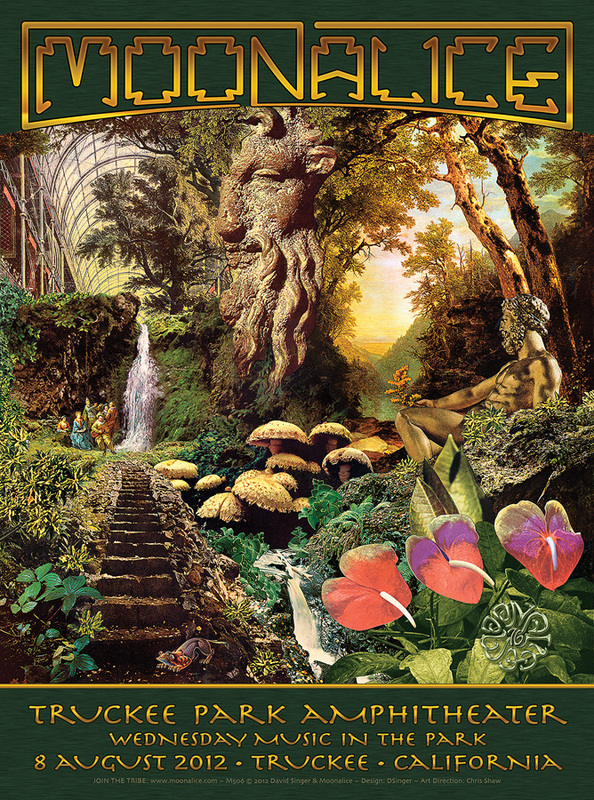 This is David Singer’s 76th poster for Moonalice. We celebrate this because David has now created one more poster for Moonalice than the 75 posters he did for Bill Graham. Moonalice believes in poster art and we are proud to support David and his art. Really wish I could of been there. Thanks for posting the show. We had a Blue Canyon Jam this last weekend 3,4,5th but I wished I knew the band was coming up this way maybe you could of stop by and play maybe next year? first weekend in August. there's another one that's happening in October in Big Basin north of Santa Cruz, friends of my have property next to the park. heard Great American Taxi may come and hang out for the weekend, but not confirmed yet. if you ever heard of them. just missed you to when you played in Auburn, but did manage to get the poster, Thanks. Pete played on my Rhodes when I lived behind Peri's bar what a treat that was.That was after Pete and Terry Haggerdy played in the backyard. Anyway really glad you are recording your shows. Watch MoonAlicetv when I think about you guys and what's happening with the band. Glad I joined the tribe!!! Finally Peace Aaron and thanks again for the good vibes!!! Really wish I could of been there. Thanks for posting the show. We had a Blue Canyon Jam this last weekend 3,4,5th but I wished I knew the band was coming up this way maybe you could of stop by and play next year? first weekend in August. there's another one that's happening in October in Big Sur friends of my have property next to the park. heard Great American Taxi may come and hang out for the weekend, but not confirmed yet. if you ever heard of them. just missed you to when you played in Auburn, but did manage to get the poster, Thanks. Pete played on my Rhodes when I lived behind Peri's bar what a treat that was. That was after he and Terry Haggerdy play in the backyard. Anyway really glad you are recording your shows. Watch MoonAlicetv when I think about you guys and what's happening with the band. Glad I joined the tribe!!! Finally Peace Aaron and thanks again for the good vibes!! !